Visitation School is pleased to begin the third year of our partnership with Chicago Jesuit Academy. As Catholic schools, we seek to develop our students’ faith life and provide them with opportunities to serve others and learn more about their world. We believe that a partnership between our two schools enables both student bodies grow spiritually, socially, and academically. Our vision is to create opportunities for students to learn and serve together. Why do we partner with another school? 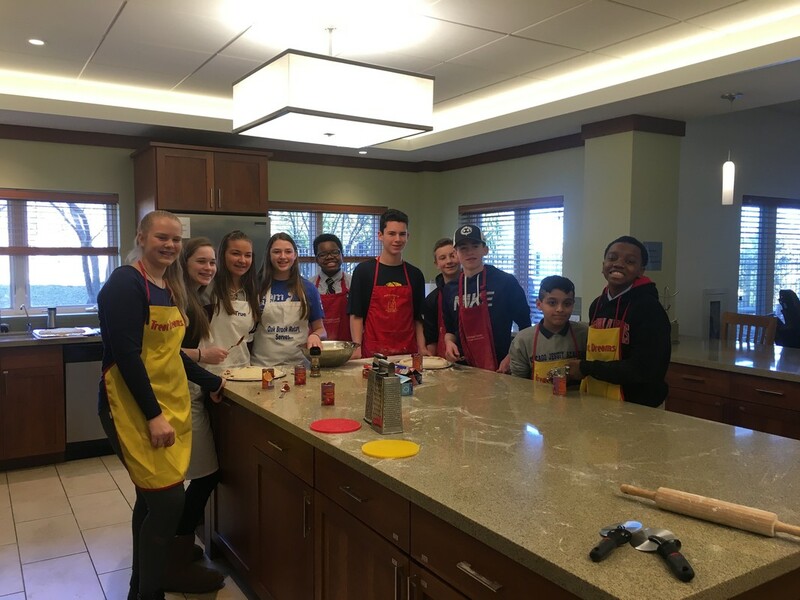 ​Visitation School’s new Strategic Plan identified a goal of increasing opportunities for our students to do service projects that would enable them both to be helpful to others and to learn about the world outside of Elmhurst. The Plan envisioned that these “service learning” opportunities would be best accomplished in partnership with another school, either an urban Chicago school or an overseas school. Why is Chicago Jesuit Academy (CJA) a good fit for Visitation? Matthew Lynch, a Visitation graduate, founded CJA about 12 years ago and continues to serve as the school’s president. His parents Barb and George Lynch and his sister Sarah Tardiff and her husband Dan are Visitation parishioners. The Tardiff children attend Visitation School and Sarah was a Visitation teacher. Many Visitation alumni and parents of alumni have been supporters of CJA since the school’s inception. For example, CJA’s volunteer librarian is Jane Reidy, parent of three Visitation graduates. And while our student bodies differ in socio-economic background, the two schools share a commitment ​to providing strong academic programs that will lead their graduates to succeed at college-prep high schools and beyond. Tell me more about CJA. Located in the Austin neighborhood on Chicago’s west side, CJA educates about 110 boys grades 5-8. The boys are admitted based in part on their family’s qualification for the federal free and reduced-price lunch program. Students must also demonstrate a commitment to work hard and have the support of their parents / guardians. The average incoming fifth grader tests at a third grade level and the average graduating eighth grader tests at a tenth grade level. Students attend school 10.5 hours/day, 11 months/year. They have small class sizes and an impressive faculty, most of whom hold graduate degrees and attended schools such as Georgetown, Boston College, the University of Illinois, and the University of Notre Dame. In addition to a rigorous academic curriculum, CJA focuses on forming future leaders and “gentlemen for others” in the Jesuit tradition. All CJA students receive a full tuition scholarship thanks to the generosity of the school’s many benefactors. The school spends nearly $20,000 per student per year. In addition to the costs of classroom instruction, the staff provides some medical and dental care, social work services, tutoring, and college persistence services to many of its students. Students eat three nutritious meals at school every day. All CJA graduates have earned admission to at least one college prep high school. They attend local schools including St. Ignatius, Loyola Academy, Nazareth, and Noble Street Charter Schools in addition to boarding schools including Culver Academy (IN), Episcopal High School (VA), and La Lumiere (IN). The majority of CJA students live in single-parent households. 97% are African American and 2% are Latino. The median CJA household income is about half that of the median Illinois household. What will this partnership involve? After conversations with the Visitation student council and CJA leadership, we have identified an interest in three categories of joint activities: social, service, and academic. We launched the relationship two years ago with a social event for our fifth and sixth graders and it was such a success that we repeated it last year. CJA has hosted Visitation for a dodgeball game and pizza party in their newly constructed gym. A few seventh and eighth graders from each school participated to organize and lead teams of fifth and sixth graders. The second step will be a joint service project with seventh graders from both schools. Last year we collaborated on planning, preparing and serving lunch at Ronald McDonald House near Loyola Hospital. This has involved smaller groups from each school and provided an opportunity for the students to get to know each other better while being of service. We offered a fall and spring Ronald McDonald House during the 2014-15 school year and anticipate doing the same thing this year. The final step will be a joint academic activity with eighth graders from both schools. This might be Battle of the Books, Pi Day, a Geography Bee, or an academic trivia contest. These are the initial plans but other ideas may develop as the relationship progresses. Will this involve our whole school? ​Because CJA serves fifth through eighth graders, this partnership will primarily involve the same grades at Visitation. Although CJA is all-boys, the girls on the Visitation student council have expressed a strong interest in participating in all events, understanding that there will be no CJA girls. ​Parents can send their children to events with CJA, sign up for a tour of the CJA campus, volunteer to help organize or run joint events, and contribute financially to the partnership activities or to CJA’s scholarship fund.